Dr Gazelle Aram is a double board certified Anesthesiologist and Pain Management Specialist, Fellowship trained in the latest non-surgical techniques to provide relief for a variety of pain conditions. Dr Aram is well known for her commitment to her patients and providing concierge-level care. She fully understand that pain affects every aspect of the patient’s life. Her warm bed-side manner and willingness to listen allow her to know her patients on a personal level and provide individualized care that treats pain from different angles. She takes the time to listen and get to know her patients so that she can create individualized treatment plans. Treatments are aimed at avoiding surgery and returning patients to enjoying their favorite activities. Dr Gazelle Aram, grew up in the Boston area and graduated in the top 10% of her class from Albany Medical College in New York. She is double board certified in pain management and anesthesiology. She completed an Internal Medicine internship at Lahey Clinic in Massachusetts followed by a rigorous three year Anesthesiology residency at Jackson Memorial Hospital in Miami, FL. She then went on to complete a competitive Fellowship in pain Management at University of California San Diego. Dr. Aram then worked as faculty member at major medical centers such as Case Western University Hospital and Lahey Clinic. She is an expert at using fluoroscopy and ultrasound technology to perform pain relieving procedures on the spine, joints and other painful anatomic sites. She specializes in treatment of low back pain, neck pain, headaches, joint pains, vein disease, muscle and tendon disorders and other complex pain conditions. 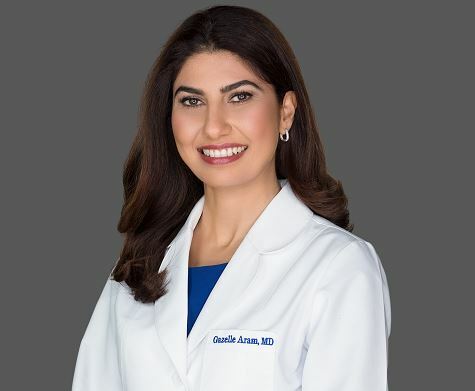 Dr Aram is an active member of the Broward and Palm Beach County Medical Societies. She feels that being involved in her community is extremely important and to this end she advocates for her patients and the future of medicine as a delegate to the Florida Medical Association. She has also been nominated for the prestigious Physician Leadership Academy which aims to prepare physicians to be leaders in the community.